Janell Howland is in her fourth seasons as the women’s golf head coach at UNCG in 2017-18. Prior to UNCG, Howland had been the associate head women’s golf coach at Ole Miss for four years and spent eight years as a professional golfer. During her time in Oxford, Howland helped the Rebels to three NCAA Regional appearances in four seasons. Last season, Ole Miss sent an individual to the NCAA Regionals as Abby Newton finished 36th in Tallahassee. The Rebels had three consecutive appearances in the NCAA Regionals during Howland’s first three years, heading to Daytona Beach in 2011 (14th place), Columbus in 2012 (13th place) and Auburn in 2013 (18thplace). During her time at Ole Miss, Howland has handled a variety of aspects of the program and specializes in the short game area of women’s golf. She created a Big Break Rebel Style short game competition for her student-athletes and is a certified AimPoint Putting Green Reading Instructor. Additionally, she has served as the Tournament Director for the Rebel Intercollegiate Tournament. Prior to Ole Miss, Howland worked for a year as a volunteer assistant coach at UNCW, helping Sofia Hagsund to an NCAA East Regional appearance. A two-time (2005, 2009) member of the LPGA Tour and an eight member of the LPGA Duramed Futures Tour (currently Symetra Tour), Howland has taken part in more than 120 events and has posted 11 top-10 finishes. Her career best finish came at the 2007 Louisiana Pelican Classic where she earned medalist honors. She ranks in the top 50 among the tour’s career money winners and participated in the 2008 U.S. Women’s Open. 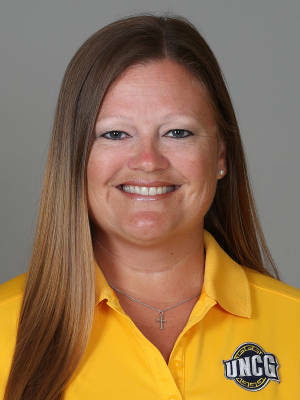 Howland began her collegiate career at Trine University (Tri-State University) and led the squad to the 1997 NAIA Women’s Golf National Championship. She won individual medalist honors at the 1998 Manchester Championship and posted a runner-up finish at the Tri-State Championship. After two seasons at Trine, Howland transferred to Lamar University and continued to enjoy success on the links. She won the Sam Houston State Championship and the Springlake Championship in 1999. She earned her degree in business administration marketing in 2000 from Lamar. After college, Howland won the 2001 Bermuda Match Play Championship. She also dominated women’s amateur golf in Idaho, winning both the Women’s Stroke Play and Match Play Championships in 2001 and 2002 before turning pro in October of 2002. She was a leader of the Fellowship of Christian Athletes (FCA) on the Duramed Tour from 2004-2010.